At the end of my second day in Williams we went searching for the Elk again. The few that we found were too far away to photograph, so in the fading light, we decided to head back. 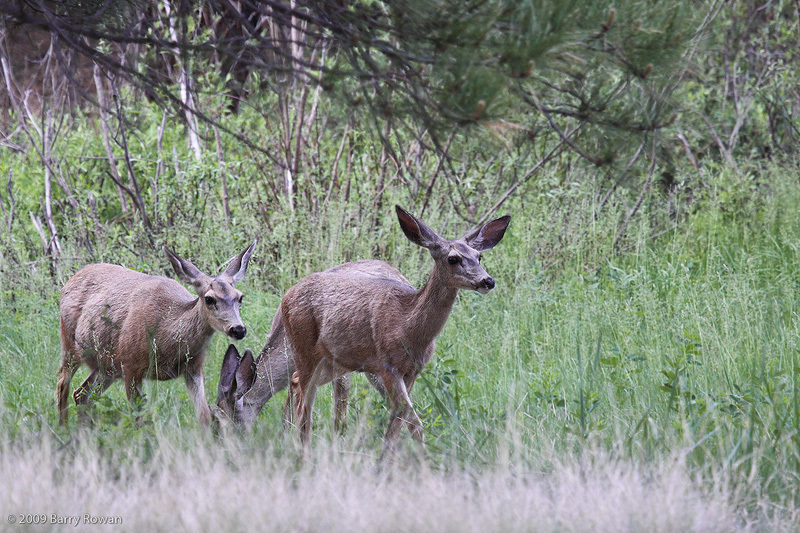 Luckily one of us spotted this group of mule deer heading out of the forest. They seemed more curious than scared and allowed me to get a ton of photos. Here are a bunch of non-flower photos from my wednesday trip to Figueroa Mountain. After spending some time at the hill, I wandered around looking for deer and other mammals. I managed to find a small group of mule deer and a very busy squirrel. Still hoping to see a fox or something even more interesting on one of my trips up there. The sunset shots were an extra bonus to the day. When I left Santa Barbara, the skies were perfectly clear, with no clouds forecast. I was quite happy to see some high clouds glide in as the sun set. I was also glad the herd of cows decided to stop standing in the middle of the road on my way back in the dark! Hopefully I’ll be able to get out there several more times while the grass is green and the flowers are blooming. Two things had me heading up to Figueroa Mountain after work on wednesday: cloudy skies with rain forecast for the weekend and a report that the wildflower displays were exploding from the warm weather this week. It was definitely the perfect time to head up there. While there was a surprising amount of traffic on the road, I seemingly had the flower fields to myself (more on that later). The first area I stopped at was heavily populated with Goldfields and Poppies. There were a lot of other species that I can’t name, which reminds me to go look for a wildflower book tonight. Unnoticed by me at first, were a surprising number of Chocolate Lilies “hiding” among the other flowers. These appeared to be past their peak and I hoped to find younger plants higher up, but didn’t get a chance to search for them. Adding to the beauty of this place were “flocks” of butterflies that would float by riding the wind. I have never seen anything like this. Groups of 20-40 orange butterflies would glide over the road and descend on a patch of flowers and then be off again. I then made a stop at the famous flower hillside. The scent of nectar from the Lupine was intoxicating and I spent a while just sitting there breathing it in. There aren’t as many Poppies as I have seen there before, but I have a feeling they will continue to increase in numbers. There is a real challenge to capturing engaging photos at this spot. The huge number of flowers can actually make it difficult to capture an image with a clear point of interest. The best images were from shooting my 35mm f/2 wide open to minimize depth of field as much as possible. I’ll have to get back there with some other primes and try some different focal lengths. But I am quite happy with how several of the photos turned out. Deer are quite common in this particular area and I was somewhat disappointed that I hadn’t seen any, although it was still quite early. My plan was to head back to the car and drive around until dusk and hope to find a small group of them. On the walk to the car, I was surprised to spot a lone deer standing in a field above the flowers I had been photographing. It was quite far from me so I knew I would have to get closer if I wanted to get a good photo. So, I scrambled up the hillside through a group of pine trees, making a lot of noise, and of course it was gone by the time I made it to the edge of the meadow. Since I had already climbed up the difficult part, I decided to walk around the meadow looking for flowers. Happily, the deer had not retreated very far and was standing at the opposite side of the field. Amazingly, after taking several photos of it, the deer walked back into the meadow and started grazing. It definitely knew I was there, but seemed very unconcerned about my presence. I moved uphill to the middle of the field, away from the deer, and much to my surprise, it continued to walk in my direction. At one point it must have been within 25 feet of me. The deer appeared to be fairly young which might explain its lack of concern. I probably spent a good 30 minutes in the field with the deer, which was a very cool experience. I had a hard time coming up with a title for this post, until I realized that each picture had a different feel based on the quality of light. These were all taken around the same time of day, but it is amazing the difference a few minutes can make. The many different environments in Santa Barbara County also seem to have their own unique signature when it comes to quality of light.